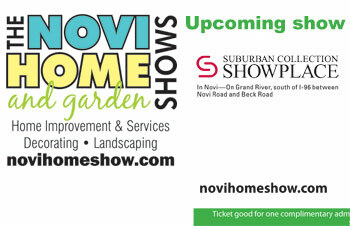 Showcasing home and landscaping trends for 65 years, The Novi Home Show is the one-stop destination to find home improvement products and services for every type of project imaginable, decorating and landscaping exhibits as well as experienced businesses available for consulting or hire. Friday October 11: 2-8 p.m.
Saturday October 12: 10 a.m.-8 p.m.
Sunday October 13: 10 a.m.-5 p.m.
Exhibitors include, but are not limited to, siding professionals, landscapers, builders, kitchen and bathroom remodelers, waterproofing experts, countertop installers, basement refinishers and much more. New arena with 65,000 square feet of The Novi Home Show exhibits. Click above to take a tour of our October 2018 Novi Home Show.